We all remember the glorious Altador; hidden behind the Lost Desert, initially only accessible by a portal found in Faerieland. Over the years, its true location had been discovered after the successful removal of the memory loss, the return to power of its leaders and the commencement of the Altador Cup. 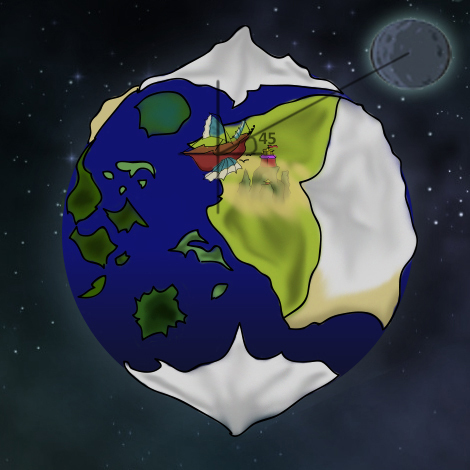 But with the return of the leaders’ memory and true potential that was inhibited for so long, Neopian astronomers were able to finally validate that the twelve known constellations which adorned the Neopian night sky for years were hiding secrets, and further their research into some form of correlation between the constellations and the position of Neopia at a given day. Chaos rampaged Neopia during the last few days, as a plethora of Neopian citizens claimed that Altadorian constellations hide a deeper, hidden power. Extensive research has been carried out in order to validate if these rumours are a hoax or a true hidden potential to be further explored. Here outlined are the current findings, after several conversations with astronomers. Special thanks go out to Barac “Cafuu” Fishmonk (cosmologist based in Roo Island), L. Abe the Third (astronomer in Altador) and Ms Bycke (planetary scientist in Shenkuu). Other than the astronomy clubs found in abundance all over Altador, one of the biggest sources of research of the constellations is the Shenkuu Lunar temple. After a conversation with the wise old Gnorbu, there seems to be a clear connection between the position of Kreludor and the position of Neopia in the sky at any given day. That is because Kreludor is Neo-locked in orbit around Neopia. Furthermore, the position of Neopia determines which constellations are most visible for that day. According to his calculations, some type of formula governs this dependance. This new, groundbreaking theory puts aside some older theories which assumed that the most powerful constellation for any given Neopian day actually was the brightest one in the sky. Thus it is important to distinguish that on a given day, one constellation will be the most powerful while another one may (or may not) be the brightest in the sky. 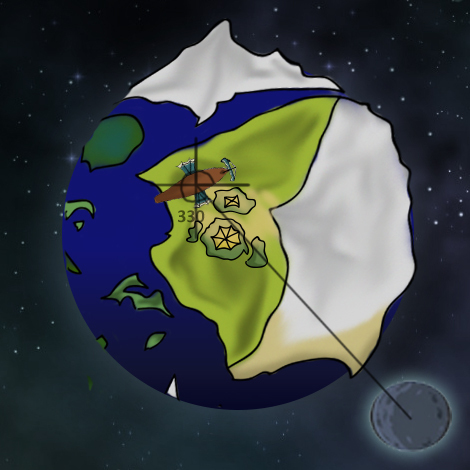 Therefore, the two independent variables that we require are the position of Kreludor in angular components and knowledge of the brightest constellation of the night determined by the position of Neopia. Both variables are determined at midnight (12:01 am NST) of the day, from the Shenkuu Lunar temple. These are quickly forwarded to the Altadorian astronomers’ clubs via Weewoos or Yooyus. 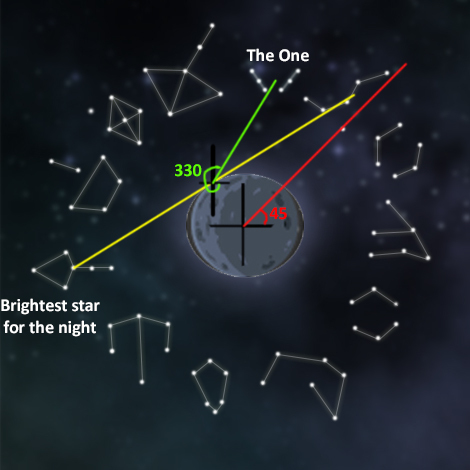 After extensive research, it has been determined that a graphical method needs to be used to solve for the most powerful constellation of the night, from now on called ‘The One’. The following schematic representation shows a possible graphical method to solve for The One, devised after extensive research and countless conversations. In some cases, it might fully represent The true One. Nevertheless it should be a close approximation to the actual scientific method used. Please follow the methodology as well as the illustrated figures to comprehend fully. First of all, we make use of a graph paper with Kreludor on the origin with all 12 constellations around it in a circular manner, as shown in the first figure. Using the longitudinal coordinate X, of Kreludor’s location (obtained as outlined earlier), we measure the angle from the origin and draw a straight line called A. Care must be taken to use an anti-clockwise manner when drawing the line for the longitudinal coordinate. This line A will be close to one of the constellations around Kreludor. From the centre of that constellation, we draw a line B, towards the brightest star of the night. 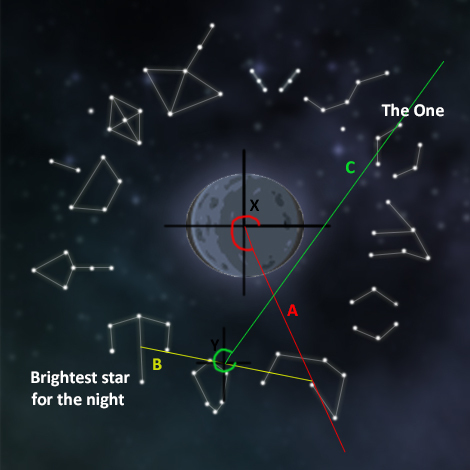 We then find the mid-point of line B and using that as our new origin, we use the latitudinal coordinate Y, of Kreludor to draw a third line C. Whichever constellation is closest to line C, that is The One for the night. The following figures show the generic arrangement of Kreludor and followed by a real example performed on the 5th of the Month of Celebrating. In our example, the coordinates of Kreludor were found to be 45 and 330 degrees. The brightest star for the 5th was The Thief. Using our methodology shows that The One was The Dreamer for that day. This was further proved due to Neopets reporting that they had gained The Dreamer’s hidden power. Read on for the discussion on how each of the Ones affects certain Neopets. It is worth noting that not all Neopets will be affected on that night. We are all aware of the twelve constellations. In this part of the article we are going to cover what hidden power each constellation bears, given that it is The One for a specific night. Allows the user to induce a sedative feeling at will to those around him. Has a finite power which needs to recharge once every so often. Effectiveness of the sedation depends on the physique of those around him as well as on the potential of the user. Allows the user to persuade others around him only for non-malicious acts. Especially prominent when the user motivates and persuades someone to reach for his best potential, thus to achieve one’s dreams and goals. The user glows in a high frequency light, barely visible to those around him but perfectly visible to him. In fact this light can be used to lead one’s way through mazes such as the Deserted Tomb in Geraptiku or the Faeries’ Cavern with 100% rate of success. It can also occasionally increase the probability of gaining extra neopoints doing certain activities such as visiting the Forgotten Shore. Certain food items consumed by the user will not disappear for the rest of the day, allowing an ‘everlasting’ effect. This is comparable to the Everlasting Apple, but it is limited to only certain food items. A comprehensive list of all the food items is not yet available. Induces a carefree and relaxed mood around the user as will. This can calm even the angriest of Skeiths. Like the Sleeper’s effect, it has a recharge time and its power depends both on the susceptance of those around the user as well as the user’s power. Comparable to the Healing Springs, this power allows the user to heal both his own as well as a finite number of other Neopets’ wounds. There is a limit on the number of others the user can heal. Unlike the Healing Springs, the water will always heal everyone to their maximum hit-points, while removing any illnesses but not aiding in hunger. Increases the attack and hit points of the user by 10% of their maximum value for the whole day that this One is activated. Effects take place during battledome challenges or in activities that require extra strength and stamina. Allows the user to view more items in shops, earlier than the rest of the shoppers. The user has an advantage because he can buy the items before the others have a chance. There is also a probability that the items will restock at 33% of their actual value, but the discount is subject to the influence of The One over the shopkeeper, rather than the user. User gains the ability to stealthily sneak for the whole duration of the day, given that his sneaking is not used for malicious acts. Events such as approaching the Snowager or poking the meteor with a stick have a much higher rate of success, which tends to unity the more experienced the user is. All the petpets around Neopia are able to communicate with the user of the Gatherer power. This can lead to petpets joining the user at their own will, with no form of payment needed. An extra advantage is the use in the Kadoatery, where the user can talk with the Kadoaties and hopefully persuade them that he had fed them - despite giving them plain petpet food - thus gaining recognition that way. Allows the user to summon a force field which dramatically increases his defence. The shield’s defence depends on the user’s health, estimated to be around 45% of the maximum hit points. Like the Gladiator, this increased defence due to the shield can be used in the battledome or during activities that require extra defences. This One has no definite hidden power associated with it. Most of the times it will grant the user one of the aforementioned 11 hidden powers. As we were informed by Barac “Cafuu” Fishmonk, there were cases where Neopets reported control over fire and in some rarer cases instant teleportation to Sloth’s Lair. Further research required. Concluding this article, the outcome is that constellations do influence certain hidden powers to surface, granting them to certain Neopets as discussed above. Current theories suggest a correlation between the order that The Ones express themselves and an extra effect associated with that. The most popular theory foresees that the Sleeper-Dreamer-First to rise will be a force to be reckoned with. Further research is required, as no Neopet has, to date, exhibited any extra effects due to this lucky order of Ones. In addition, astronomers are also looking to better define the Hunter’s hidden power.